It’s a big week for United States economic data, with the Federal Open Market Committee (FOMC) meeting on Tuesday-Wednesday, second quarter GDP figures being released on Wednesday, and employment data coming out on Friday. Markets are already reacting, with the 24-hour gold spot price reaching a one-week high of $1,312 per ounce early Tuesday morning, and then falling to $1,298 by mid-morning. Bloomberg also reports that trading volume was 80% above the average for the past 100 days for that time of day (Tuesday morning). No one can predict with certainty how gold prices will react, but investors can at least know what they should pay attention to. An article in Money Morning suggests keeping an eye on “the two I’s”: interest rates and inflation. Remember that in early July, Fed chairwoman Janet Yellen stated that interest rate hikes may come “sooner and be more rapid than currently envisioned” if the labor market continued to improve faster than the Fed had anticipated. The Fed previously said they wouldn’t consider increasing interest rates until the unemployment rate hit 5.2% to 5.6%. June’s unemployment rate was 6.1%, so the Fed’s target range is still a ways away. 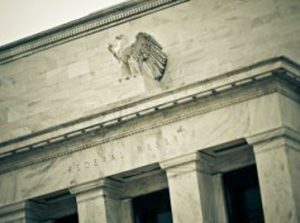 Money Morning Resource Specialist Peter Krauth added: “It’s tough to say how gold prices will react this week, even if we know exactly what the Fed will say. However, with low interest rates that are likely to stay low for some time, the opportunity cost of owning gold is next to zero, making it an attractive asset. I actually expect long term-rates to continue to trend downward for some time.” Investors have taken the last few Fed statements with a grain of salt, acting more skeptical than anything else, so Krauth may be correct. As we mentioned last week, inflation has been creeping steadily upward. The Consumer Price Index (CPI), which measures the costs of consumer goods and services purchased by households, increased by 0.3% in June after a 0.4% increase in May. Food and gas prices in particular have been on the rise. The latest U.S. inflation rate, covering the year 2013, was 1.6% – below the Fed’s target rate of 2%. However, Krauth believes that although this rate is low, inflation is still on the rise. “It’s still early in this trend, but once we have a few consecutive quarters of close to 2% inflation, I think the market will start to expect continuing rising inflation, making gold more attractive,” he said. Again, always keep in mind that no one has a crystal ball when it comes to predicting future market activity, and there is no perfect time to buy gold. However, whether you already own gold or are considering purchasing it for the first time, it is important to know the relationship gold has with certain elements of the economy and that price fluctuations are normal. The reasons gold correlates with these economic factors is fundamental to why investors buy it in the first place: it is a hedge against inflation and is trusted to hold its value even during times of economic turmoil. And did you know that gold and other precious metals can even be added to your retirement portfolio? Call American Bullion at 1-800-326-9598 to see if you qualify to have your retirement account rolled over or transferred to a Gold IRA holding physical precious metals. It is a tax-free, penalty-free transaction. Piece of gold means peace of mind.